As image-bearers of God, we are relational beings, which means that we were made to communicate and live in a community. BJU’s communication program equips you for a wide variety of careers, and prepares you to excel in whatever community God leads you to. Here at BJU you’ll learn the value of biblically grounded communication, and why integrity, truthfulness and others-focused communication are essential for effective interaction. And with courses like Interpersonal Communication, Conflict Management and Leadership Communication, you’ll learn how to build rapport with people from a wide variety of backgrounds. From your very first course in communication (Principles of Communication), you’ll explore the fascinating world of senders and receivers, power distances, nonverbal codes and much more. Our qualified faculty present each course from a Christian worldview, applying biblical principles to all aspects of communication and encouraging you to do the same. Because communication is a broad subject, it offers you tremendous flexibility. If you have an interest in organizational communication, interpersonal communication or rhetoric and public address, you can take communication courses that further explore these areas. 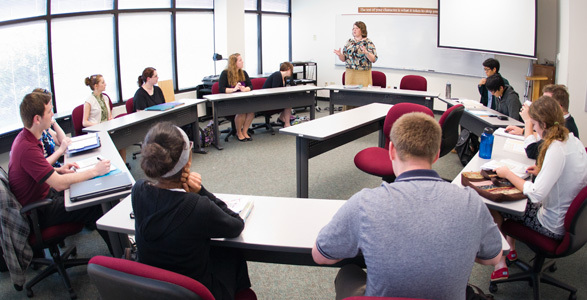 Communication at BJU is also a great major for students interested in politics, political science, law or leadership. As an effective communicator, it’s important to be able to connect with your audience. That’s why the BJU Core is so crucial for you as a communicator. Classes in history, art, English and other subject areas will help you appreciate other points of view and adapt to a variety of situations, thereby extending your witness for Christ as well. Your Bible classes will help you more fully understand and appreciate the overarching themes of Scripture, as well as the themes of individual books. You’ll learn how to apply biblical truth to your own life, and how to effectively communicate that truth to others. We have a wide variety of elective courses to help you fit your program to your career goals. If you’re interested in specializing in interpersonal communication, you can take electives like Conflict Management and Intercultural Communication. If you’d like to develop your public speaking skills, you can take classes like Argumentation & Debate and Persuasion. If you’re leaning toward organizational communication, you can opt for electives like Organizational Communication and Community Training & Development. We also encourage you to take a few classes in business, human resources or journalism and mass communication. These subject areas will give you opportunities to sample various career options so you can find the best fit for you—and then prepare you to excel wherever God leads you. Without an internship and without courses at BJU such as business writing, organizational communication, public relations and persuasion, I wouldn’t be where I am today. Looking at my current positions—in a marketing firm and as a marketing entrepreneur—some may wonder why I wasn’t a marketing major. The short answer is I didn’t want to be limited to a business degree. A communication degree is amazingly flexible. Somehow it united my odd blend of music, computer, business, and counseling electives. It is flexible, yet practical. We took field trips to major corporations and met local businesspeople. Finally, every communication student gets real-world experience in an internship. To my surprise, I landed an internship that I pursued on my own. At the close of my internship, they offered me a full-time position. What an exciting conclusion to my degree! Each step of the way God has directed my path, just as He will do for each of His children for His glory. When it comes to extracurricular experience, you’ll have plenty to choose from. You’ll be able to practice your skills in communication both on campus and off campus, whether through acting in student-run plays, participating in the debate team, giving a devotional to your society and much more. You also can take advantage of internships in town to begin networking and get a head start in your field. Each semester the pre-law forum invites several experienced legal professionals to BJU to speak about their challenges and opportunities in the workplace. These personable public speakers highlight ways God enables them to live out their faith in the workplace and they encourage students who are interested in law to pursue a career in it. All students and guests from the community are welcome to attend. Each fall, BJU’s Student Legislature team travels to South Carolina’s state capital, Columbia, to join with students from 10 to 15 major colleges and universities in the state. Together they form a house and senate, presided over by officers elected from among their members. Students use their extemporaneous speaking abilities, persuasive powers and knowledge of current events to pass legislation that they have written. Bob Jones University’s student newspaper, The Collegian, was founded in 1987 as a journalism lab, offering students hands-on experience in producing a weekly publication. Newspaper staff write and edit articles, design the layout and take photographs. Stories in The Collegian focus on campus personalities and student life, helping to unify the large and diverse student body. The paper is distributed free on campus and is also available online. The staff for the Vintage, BJU’s yearbook, comprises on average 18 student members of all classifications. Under the oversight of a few BJU staff sponsors, the Vintage staff is responsible for the book’s production from start to finish each year. Vintage members develop the book’s theme, write copy about featured people and events, schedule and help organize photo shoots, design pages and work with outside companies involved in the printing of the book. At BJU you’ll study under our highly qualified faculty, many of whom have PhDs in the areas of communication and leadership from universities such as University of Kansas, University of Illinois, Southern Illinois University at Carbondale and University of Nebraska. Faculty also have many years’ of corporate experience and currently serve as business consultants, trainers and mediators. Analyze human communication from a biblical perspective. Apply multiple theories of human communication to communication problems. Apply principles of oral communication in public, organizational or interpersonal settings.